Anne grew up to be an outspoken woman. Anne's father, Fransis Marbury, was jailed more that once in England for his non-conformist views and Anne had been deeply influenced by her rebellious father. Anne grew up in an atmosphere of learning. She learned the scripture and theology from her father, who was a Deacon in the church of England. Her father's own troubles with the church left a big impression on her. Anne marries and has fourteen children. 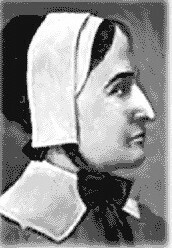 On August 9, 1612, Anne married William Hutchinson, a London merchant. She had fourteen children and took them everywhere she and her husband went. Her children were Susanna, Faith, Edward, Bridget, Richard, Francis, Elizabeth, William, Samuel, Anne, Mary, Katherine, Zuriel, and another William. Her children either died young or in the Indian attack with Anne. Anne and her family move to Boston. Highly successful in his mercantile business, William Hutchinson brought a considerable estate with him to New England. After arriving in Boston, the Hutchinson family purchased a half- acre lot on the Shawmut Peninsula. They had a house built there in the Shawmut Peninsula, one of the largest in the Peninsula.The Hutchinsons soon were granted Taylor's Island in the Boston harbor, where they grazed their sheep. William Hutchinson continued to prosper in the cloth trade, and made land purchases and investments. He became a town selectman and deputy to the General Court. Anne preaches when she is female. 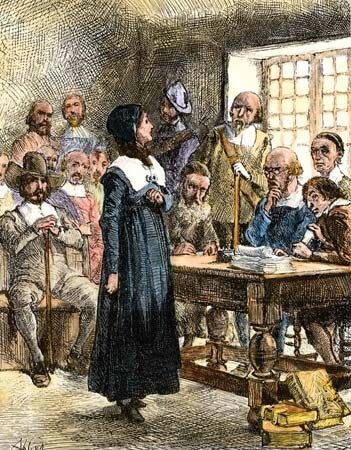 Anne may have been persecuted because in preaching, she was stepping beyond the gender role than considered appropriate for a woman. Anne spoke her mind freely within the context of a male hierarchy unaccustomed to outspoken women. 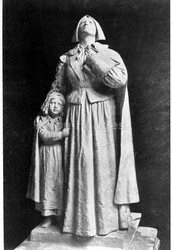 John Winthrop described her as "a woman of ready wit and bold spirit." She failed to appreciate what the court knew all too well: that "the force of female heretic vastly exceeds her heresy." 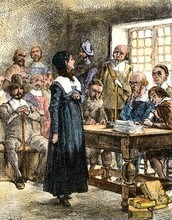 She was condemned for undertaking the roles of teacher, minister, magistrate, and husband. Anne has a home Bible study group. Anne's visit to women in childbirth led to discussions along the lines of the conventicles in England. She soon began hosting weekly meetings at her home for women who wanted to discuss Cotton's sermons. Her meetings for women became so popular that she had to organize meetings for men as well. She was hosting sixty or more people per week. These gatherings brought women, as well as their husbands, to enquire more seriously after the Lord Jesus Christ. 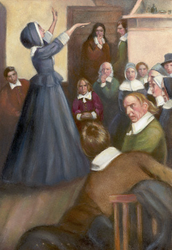 Anne dies in an Indian attack along with her six children. The Siwanoy warriors stampeded into the tiny settlement above Pelham Bay and prepared to burn down every house. The Siwanoy Chief had sent a warning out to the settlement, but at one house they found the Hutchinsons. As quickly as possible, the Siwanoy seized and scalped Anne and he six children. One of the Hutchinson's daughters, seeking to escape, was caught and killed. The warriors then dragged the bodies into the house along with the cattle, and set fire to the place, which burned to the ground. 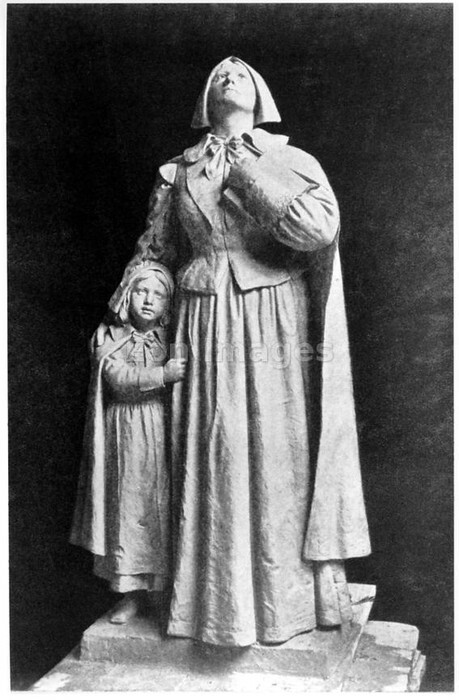 Anne's daughter, Susanna, was found alive.